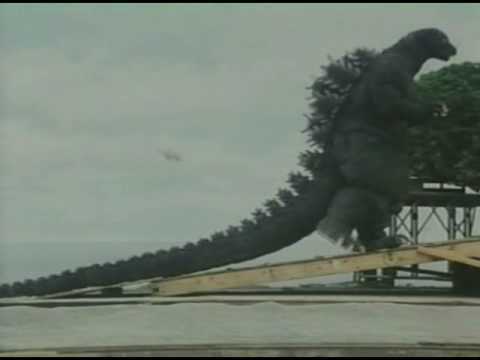 Godzilla (ゴジラ Gojira) is a daikaijū, a Japanese movie monster, first appearing in Ishirō Honda's 1954 film Godzilla. 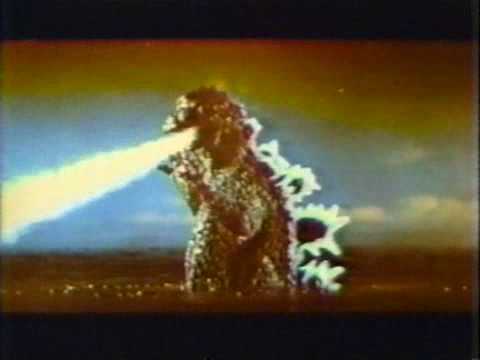 Since then, Godzilla has gone on to become a worldwide pop culture icon starring in 28 films produced by Toho Co., Ltd. The monster has appeared in numerous other media incarnations including video games, novels, comic books, and television series. An American version is currently being developed by Legendary Pictures. With the atomic bombings of Hiroshima and Nagasaki and the Daigo Fukuryū Maru incident still fresh in the Japanese consciousness, Godzilla was conceived as a monster created by nuclear detonations and a metaphor for nuclear weapons in general. As the film series expanded, some stories took on less serious undertones portraying Godzilla as a hero while other plots still portrayed him as a destructive beast. A man in a rubber suit, or a global hero? Here we see how they made the magic happen. Trailer Trash - Destroy All Monsters! The Monsters in in revolt. And the world is on the brink of destruction!!! It's lizard vs. monkey!!!! Who will win?!??! This is the film with the giant octopus too!